With approximately 63 destinations throughout South America, GOL Airlines has evolved into one of Brazil’s largest airlines. Attuned to the needs of its customer base, GOL Airlines continuously strives to expand and improve customer amenities. Because Internet connectivity is not available on its aircraft, the company realized that passengers needed an onboard entertainment system and developed a solution for its passengers. GOL’s in-house personnel developed the onboard entertainment solution in Microsoft .Net 4.0 and C#. The airplane servers use SQL Server 2008 with AWS MongoDB. The biggest challenge in achieving an onboard entertainment system was determining the best way to manage content. All content is controlled by the airline – ranging from information about passenger activity (as it relates to advertising), programming (music selections of 14,000 songs, as well as videos, magazine articles, games, news and sports content), and checking each plane for content synchronization (identifying exactly what content has been synchronized). The onboard server is installed in the aircraft.The onboard Server has an access point and provides a Wi-Fi network. 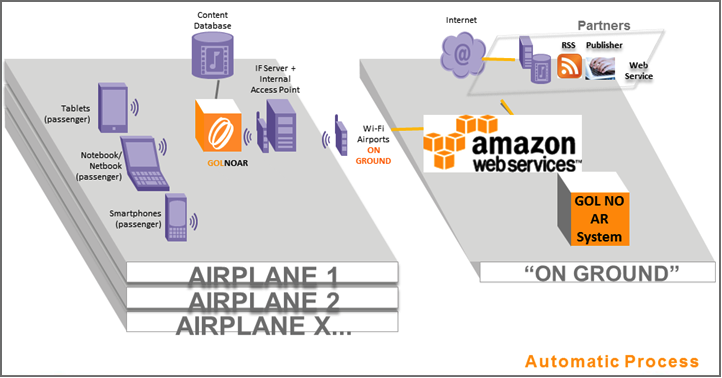 The onboard server works in conjunction with central servers in the AWS Cloud; every time a plane lands, the onboard server connects to a Wi-Fi connection in the airport, which then connects to the AWS server to synchronize the content. Customers who then access Wi-Fi from the plane – via smartphones, notebooks, and tablets – are not charged because Wi-Fi onboard is completely free. This architecture is revolutionary in the airline industry. When GOL Airlines decided to create an onboard entertainment system, the company realized that it needed a superior web services provider to successfully execute the project. Following a recommendation from its System Integrator, GOL selected AWS as the provider. AWS’s cloud expertise and affordable pricing were key factors in the decision. Furthermore, AWS’s services were ideally suited for managing the massive amount of content used by GOL. GOL has contracts with the major communications companies in Brazil, who publish new content directly in the central server. The AWS platform provides a great deal of flexibility – if there is insufficient time to update the onboard server with a very large content file, the file can be partially uploaded at the current airport and the remainder can be uploaded at the next airport. GOL has also aligned itself with various business partners, enabling them to remotely publish and modify advertisements based on the passenger destinations.The following diagram illustrates how the onboard and on-ground architecture works. The company’s highly successful experience with AWS is serving as a guideline for other projects and products within GOL.